Definition: As the name itself gives a brief description, financial management is the management of firm’s financial resources, in relation to its acquisition and application. It is that branch of management, which deals with the procuring, financing and managing business assets, to achieve the objectives of the concern. 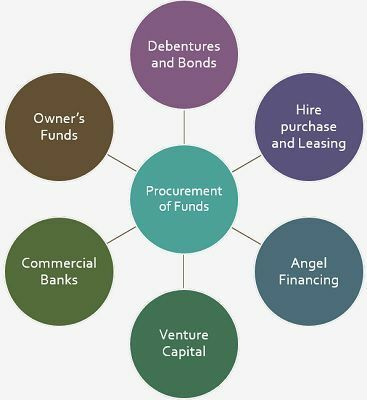 Procurement of Funds: The firm acquires funds from an array of sources, such as Debentures and Bonds, Owner’s funds, i.e. equity shares and preference shares, commercial banks, venture capital, angel financing, hire purchases and leasing. Utilization of Funds: Another important aspect of the financial management is the deployment of funds in an effective manner, i.e. the funds are to be invested in such a way that it yields good returns for the business without posing a threat to its overall solvency. Simply put, financial management deals with raising finance for the business to meet short term and long term requirement, mobilisation of funds, control over its use and creating a balance, i.e. trade-off between risk and return. Profit Maximisation: Conventionally, profit maximization is believed as the ultimate objective of the business entity. This implies that the company’s decisions are taken while keeping in mind the profits of the business. Nevertheless, profit maximisation is just one of the objectives of the business, but not the only objective. The firm’s value is reflected by the market value of the company’s shares and the Earnings Per Share, which acts as a performance index of the firm’s progress. 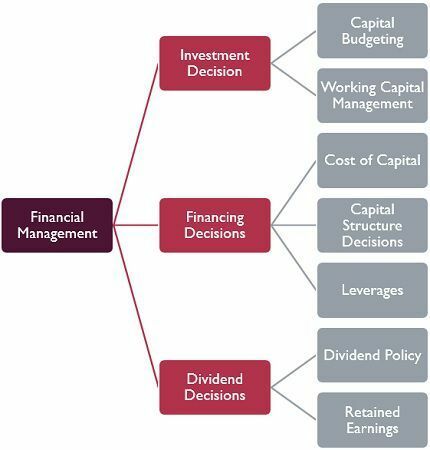 The firm’s business objective sets criteria for the decision making in Financial Management. Profit Maximisation is the basic objective of the firm, but wealth maximisation is the overall objective. And so the former is a short-term goal but the latter is the long-term goal of the enterprise. Investment Decision: The finance manager has to take a decision regarding the selection of the assets, i.e. long-term assets and short-term assets, in which the firm’s money is to be invested. While long-term investment decision is known as capital budgeting, the short-term investment decision is called as working capital management. Financing Decision: The firm’s financing decision is related to the capital structure of the business, i.e. the proportion of the debt and equity capital in the business. The decisions are made in the light of the cost of capital, risk factor involved and returns to the shareholders. Dividend Decision: As the name suggest, dividend decisions of the firm reflects the distribution of firm’s profits among the owners, i.e. shareholders. The decision will be based on certain factors such as shareholder’s preferences, future expansion opportunities and investment opportunities for the firm. Financial management ascertains the financial needs of the firms and ensures availability of the adequate funds from various sources. It aims at establishing an optimal capital mix in the business to attain maximum returns on the investment.